BREAKING: ‘Anti-MAGA’ Native American Leader, Nathan Phillips, EXPOSED — This Wasn’t The First Time He’s Pulled This Stunt! BuzzFeed and the hateful left-wing media is at it again — these MAGA teens were doxxed and are now in fear for their lives! On Friday, a group of high school boys from Kentucky went to the Lincoln Memorial after attending the March For Life. Video shows the children were not chanting, “Build the wall!” as Nathan reported. The media isn’t interested in facts — they want to push their left wing agenda so they doxxed the high school kids. The high school boy was doxxed by the liberal fascist mob. The children have received death threats by violent leftists following this incident. On Saturday one of the Catholic boys wrote the local radio station in Kentucky and BEGGED the station to report the truth and not join the far left media lynch mob. 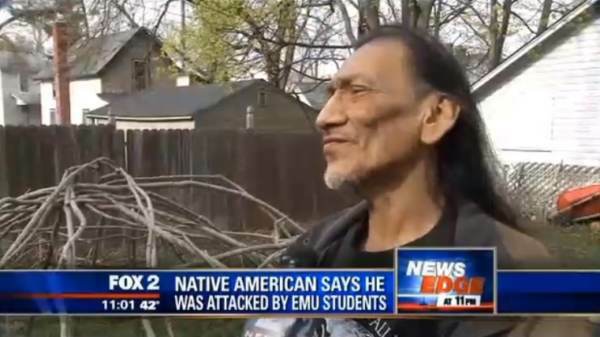 Native American activst Nathan Phillips was involved in a similar incident in 2015 where he targeted a group of mostly white frat boys. Phillips then ran to reporters and claimed he was abused after HE CONFRONTED the college kids. The “racist” incident made the news. Phillips ran to police after he confronted the university students holding a party. Next article HILARIOUS! Trump Flashes Something At Obama That Set The Ruinous Former President Seeing RED! Sandmann Lawyers Followup Lawsuit Letters With ONE. DAMNING. VIDEO! HEARTLESS Troublemaker, Nathan Phillips, Tells NBC That Student Nick Sandmann Is Full Of B.S. WATCH: NBC Host Throws Everything She’s Got At Nick Sandmann, Tells Him EVERYTHING Was His Fault…And Fails Miserably! HILARIOUS! Trump Flashes Something At Obama That Set The Ruinous Former President Seeing RED!